Excellent map too, it contains 36 Current, New and planned distilleries. I seen the map & wondered why WCD were a different colour. Any ideas other than a misprint? Here's a story in the spirit business that's disturbing if you could take it serious. It's a little vague but there will certainly be problems in the future if demand keeps rising. I'm hopeful that the powers that be have had the foresight to anticipate the rise in popularity. I noted the colour difference of WCD on the map . It certainly made me chuckle. Regarding the whiskey supply report. It strikes me as a case of "you pay the piper and call the tune" when you consider who commissioned it, and surely this is the market that John Teeling intends to supply. It's a good article to let people know a little about Irish whiskey. It's biased towards IDL as they organised it by the look of things. There's a token mention of Walsh and Dingle but I'm assuming that's because Bernard is the Irish Whiskey Association chairman & Dingle for tourism. The history is according to Midleton too. It's good to see Fionnán's book get a mention although I thought it was going to be a review but I bet they didn't even read it. It's an advertorial simple as that. I wish it was more independent and in depth but hopefully readers will find it interesting enough to explore Irish Whiskey. One line in the report ......"There are a number of significant barriers to entry in Irish whiskey distilling, including the mandatory three-year maturation period before the product can be sold" are they suggesting that something less than 3 years old should be called Whiskey? Whisky Advocate has announced its Irish Whiskey of the year. It's Midleton's Dair Ghaelach. They have also announced US, Canadian & Craft. Other results will be posted in their site over the next week. and click on the documents button....a little slow . Last edited by charleymcguffin on Sat Dec 12, 2015 8:59 pm, edited 3 times in total. The Belfast Telegraph has the story too. They don't have links to the planning that Charley Mc has. Well found. Our own Fionnán O'Connor is in the new again! Here's an interview with The Irish Times. Here's a good article on the need for a wholesale Irish Whiskey market to fill the needs of brands such as The Wild Greese who don't have their own distillery. Wild geese certainly have a good PR agency working for them reviving this report that first saw the light of day back in November. The report should be seen in context and read alongside the E.U. commission findings that I referred to in an earlier post. http://ec.europa.eu/competition/antitru ... 3_85_7.pdf . I certainly commend the new distilleries and admire their courage in starting enterprises with such a long pay off time . I do not have a problem with them sourcing product to gain brand recognition .However I do have a problem with dodgy provenance and fantasy labeling. A case in point being Kinahans LL " A forgotten Dublin Whiskey" which gives its address as 6/9 Trinity street Dublin, the Hot Press team must wonder how the call centre located opposite their offices morphed into a distillery in the last year , even the parent company, London Alcohol Co's address is a mailing service! "On the down side there are more misleading spirits than ever out there – products saying they are from one place, yet are made somewhere else; distilleries claiming to be in places they are not; even whiskeys claiming to come from distilleries that simply don’t exist. These cowboys (and cow girls) are playing with all our futures. Provenance is quite possibly our strongest hand, fake Provenance starts a relationship with the consumer that is based on a lie. You can sell just about anything once, but our industry can only survive on repeat business. At the core of that pact is honesty. Honesty in what we make, honesty in where it is made and honesty in how we package and sell. And his final word...Made in Waterford? My a***." is a shining example of a tangible that can be investigated!! If I find a bottle I object to on the net I complain to IBEC/IWA about it. I recommend you do the same. They may listen to us because we don't have a vested interest in it. We're simply alerting them of breaches or possible breaches. I've found a few outside Ireland and they are being looked at. The Liverpool Echo reposts that Halewood international drinks distributors have a deal with West Cork Distillers to sell their products. 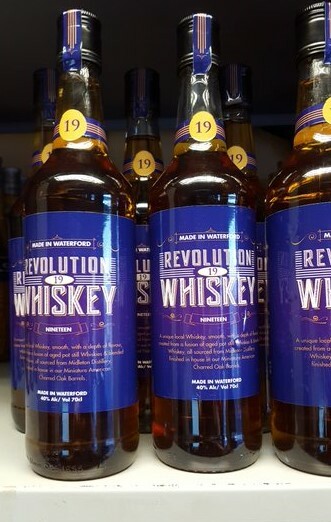 They made a big loss last year and think that joining forces with WCD will change their fortunes by riding on the rising tide of Irish Whiskey. Couldn't believe the price paid on Whiskyauction.com yesterday. must be one desperate fan. Might have been cheaper to fly here by Ryanair and pick up a bottle in person. Deserate isn't the word I'd use. It's €29/30 in supermarkets and that's too much for it. A 3 year old blend that's nothing special is worth less than €20 in reality. The Pogues name add the 50% I guess. I'd like to be the one who sold it all the same. €75 is excellent. It's takes 2 to tango, so there another out there who went to €73. If they're reading this, I'm sure if they send out a plea for assistance to getting a bottle someone here will help for a nominal fee. I can't for personal reasons but I'm sure someone will. Just been looking at the distillery map from an earlier post - looks like an update from the original IWA one. A lot has changed since the publication last summer. One down my neck of the woods that I've been keeping an eye on recently is the Chapel Gate Irish Whiskey Company, in west Clare. Planning permission issued for new micro distillery “ The Boatyard Distillery” Nos. 3 and 5 Tullybay Marina Lough Shore Road Drumcrow East Derrygonnelly .On the shores of Lough Erne. enter app no here... http://epicpublic.planningni.gov.uk/pub ... pplication Hit search button and pick Docs tab. Planning to produce gin,barrel aged gin,potato vodka and single malt whiskey. know the distillery was so far advanced!! The Irish Times has a story of Jameson sales up by 11% in their Agricultural business section. That's another massive increase in sales.